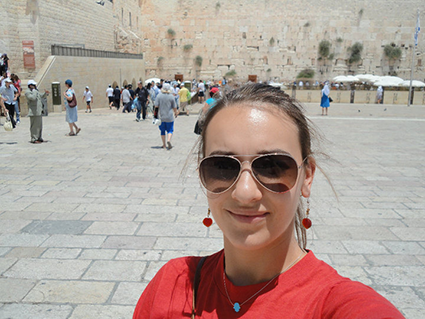 When I left my job at the United Nations last year to become a part of Hadassah’s Zionism and programming department, many of my friends—Jewish and non-Jewish—thought I was making a mistake. The United Nations sounds prestigious, exciting. Having “Zionist Policy Associate” on my business card instead would likely result in prejudgment, endless debate and a whole lot of headaches, they argued. ​But I am a proud 28-year-old Zionist. That doesn’t mean I’m a colonialist, or that I condone the persecution and subjugation of Palestinians. I am also a proud American and I don’t agree with everything the United States government does. Zionism is the natural, most simple notion that drives my scholarly, religious and cultural enchantment with Israel. I believe in the right of the Jewish people to have a state in our ancestral homeland. ​To me, Zionism is a verb—a living, evolving philosophy I actively practice. Take our founder, Henrietta Szold. She was a badass feminist, often the only woman at the table of Zionist decision-makers. Her entrepreneurial spirit and love of humanity helped form the modern medical system in Israel. Hadassah’s hospitals are seen as beacons of peace and innovation the world over. ​Many young American Jews have lost that ecstatic feeling about Israel. Maybe we feel it when we are on a Birthright Israel or Young Judaea trip. But we come back to the United States and get wrapped up in the politicization of Zionism—the loud, repeated claims that Israel is an oppressor state, the claim that you can’t be a feminist and a Zionist. And after a while, maybe we start to believe those claims. ​Don’t like what’s going on in Israel? Great! Dissent. Debate. Support. That’s also a huge part of Zionism. We need to make Zionism look the way we want it to look. If you believe that Israel has the right to exist, if you believe in democracy and the right to debate, if you admire risk-takers, dreamers and the entrepreneurial spirit, you are probably a Zionist, too. Your words are inspiring, too many of us have lost the zeal to actively support our Jewish homeland!